Horseshoe crabs are strange animals. They are prehistoric-looking and have not changed in appearance in 200 million years. The oldest horseshoe crab fossil ever found dated to 445 million years ago. Because they are so unchanged, they are widely known as “living fossils”. Horseshoe crabs on the beach. UF/IFAS Photo by Tyler Jones. However, they are not crabs at all (despite what their common name implies). They are actually more closely related to spiders. They are arthropods, which includes horseshoe crabs, insects, spiders, and other crustaceans. Like other arthropods, they have many legs and their body is divided into three major parts. Their bodies are organized very uniquely with the mouth in the middle of their 5 pairs of jointed legs. They move their legs in order to chew their food. Their tail, called a telson, is long and sharp at the end. People often think that their telson is a stinger, but it’s not. They use their tail to flip themselves over if they get stuck upside down. You should never pick a horseshoe crab up by the tail because it can cause harm to them. Horseshoe crabs are harmless to humans. In fact, you can thank horseshoe crabs for helping to prevent you from getting an infection. If you’ve ever had surgery, received a vaccine, or had fluids administered by a doctor, a horseshoe crab’s blood has helped you. The biomedical industry uses horseshoe crab blood. Horseshoe crabs have blue copper-based blood that reacts when it encounters bacteria. The blood is used to check that products placed inside the human body are sterile and won’t cause infections. Where do you find horseshoe crabs? 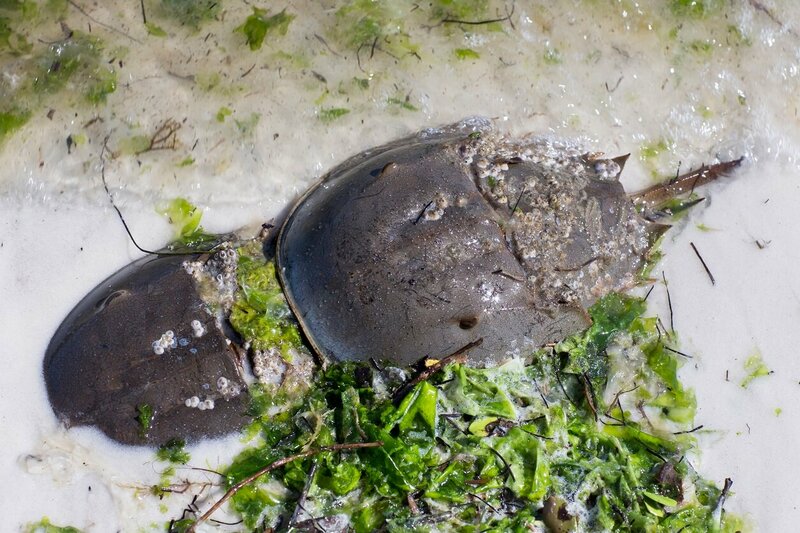 Horseshoe crabs are found in nearshore waters from Maine to Florida and across the Gulf of Mexico. They are often a common sight on sandy beaches. They come ashore to mate along beaches in the spring and fall months. You often see a larger female with one male attached and sometimes “satellite” males trying to attach themselves to her. They are waiting for her to lay her eggs in the sand so they can fertilize them. This behavior has evolved to encourage genetic diversity for the fertilized eggs, which hatch about two weeks later. Horseshoe crab on the beach. UF/IFAS Photo by Tyler Jones. This behavior also makes studying them and their population numbers fairly easy because researchers can walk along beaches where they are nesting and count individuals. They can easily be captured and tagged for mark-recapture studies. Unfortunately, there are no consistent scientific studies done here in Florida. For this reason, we don’t have a good understanding of the status of their population in Florida. Nor do we have basic information about their abundance or movement patterns from one area to another. In the Indian River Lagoon, there are only a handful of studies on horseshoe crabs. Taking measurements and data of the horseshoe crab. Photo by Holly Abeels. This citizen science program is now coming to the Indian River Lagoon. 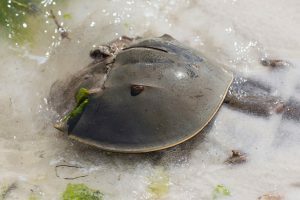 If you see horseshoe crabs along the beach, please report these sightings to FWC via their website or through their FWC Reporter mobile app. 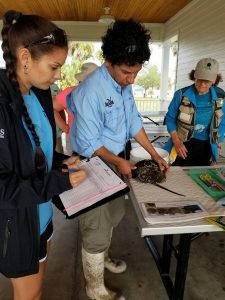 We need volunteers interested in walking designated beaches in the Indian River Lagoon, counting horseshoe crabs, collecting and tagging a subset of those crabs, and inputting the data for FWC. If you’re interested in being part of the Florida Horseshoe Crab Watch citizen science program in Brevard County please contact Holly Abeels, Florida Sea Grant Extension Agent for UF/IFAS Extension Brevard County at habeels@ufl.edu or 321-349-2333. If you’re interested in being part of the program in Indian River, St Lucie, or Martin Counties please contact Kirk Fusco, Florida Department of Environmental Protection Indian River Lagoon Aquatic Preserve at Kirk.Fusco@FloridaDEP.gov or 772-429-2995. We will be holding training workshops in January and starting field work in February. ← The 4-H Hunting Discipline Is More Than Just Hunting! I’m in for a mid Brevard county location. Thanks Ivan. I’ve put you down on my list and will be in touch once training dates are set. I’m interested and can work for Kirk in Indian River County or Holly in mid to south Brevard. Thanks Michael. I’ve put you down on my list and will be in touch once training dates are set.